On Friday morning, my boss sent me this article. The article discusses how Google is going to make the college search process easier for students and familie s. To do this, Google will be pulling existing data that students and families find relevant and pertinent about colleges and universities and making it available when a college is searched by name on Google. Although there are sites where families can go to find this type of information (see my UX post), many families, particularly first-generation families, don’t know where to look. 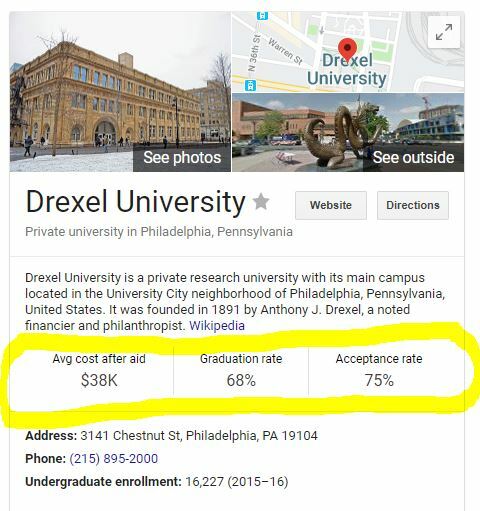 A quick search of Drexel University shows 3 key pieces of information that now appear in the right column of a google search. Previously, families would need to have known to go to a place like the College Scorecard or the College Navigator to find these data and now it’s available immediately when doing a Google search. And where does everyone go to search for information… Google, of course! It shoul d come as no surprise to anyone that Google is innovating a process like this. Isn’t that what Google does? They see a problem, a gap or an inefficiency and they fix it. In fact, the 8 Pillars of Innovation are paramount to what Google does and who Google is. These pillars should guide all of us, especially us Digital Innovation Marketers. The first pillar, “Google’s mission is to ‘organize the world’s information and make it universally accessible and useful”, is actually what drove this most recent innovation. I see the remaining pillars as almost mini-mantras to live by. In addition, as another article states, Google does four additional things to remain one of the most innovative companies in the world. While most companies or individual innovators aren’t going to have the budget or resources to invest in research quite like Google can, the other three are more realistic. If you aren’t aware of Google’s 20% rule, I think it’s something every company should consider, although 20% might be high for smaller businesses. Basically, the 20% rule enables Google employees to spend 20% of their time on projects that interest them, outside of their job responsibilities. Some of Google’s most innovative products have come from their 20% time (gmail, Adwords, etc…). Imagine the innovation and increased productivity that companies could realize if more allowed their employees to follow the 20% rule. The bottom line is that Google is one of, if not the most, innovative companies in the world, especially when it comes to process improvement. They make our lives easier, whether we know we need them to or not! Canva.com- for creating the infographic and Google.com for the Drexel screenshot. Successful Project Management, Here I Come!